At the beginning of the twenty-first century, Catholic schools in Australia lie on the edge of possibility. 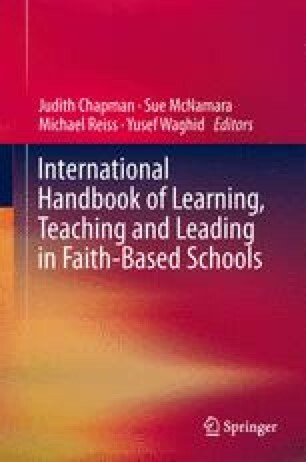 In this chapter a series of themes are presented about leading Catholic schools ‘on the edge’. The author shares his insights about Catholic schools (i) on the edge of the mainstream through reference to their position as nongovernment schools in policy and funding terms relative to schools in the public sector and secular Australian and State/Territory governments and statutory authorities, (ii) on the edge of town highlighting the context and challenges of Catholic schools serving diverse low, middle and high SES communities and the hope and distinctive educational opportunities they promote, and (iii) on the edge of faith drawing upon ecclesial writings, research findings and emerging forms of governance relating to the authenticity and sustainability of Catholic schools. The message from these insights is that leading Catholic schools ‘on the edge’ not only requires a thorough understanding of the local community context; broader educational trends, accountabilities and opportunities; and the teachings and changes in the Church; but also an appreciation of what emerging Catholic school communities can be. The implication is that Catholic school leaders need to have a vision for Catholic schools on the edge of possibility that encompasses the challenges of distinctiveness, equity, diversity, authenticity and sustainability; and the capability to share and realize that vision.